An engine failure forced Jack McKay, a NASA research pilot, to make an emergency landing at Mud Lake, Nevada, in the second X-15. 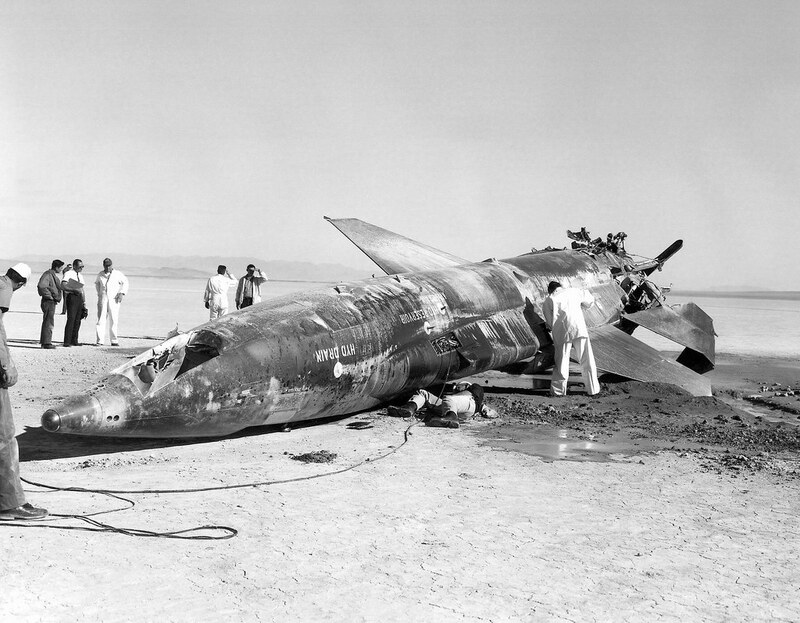 The aircraft’s landing gear collapsed and the X-15 flipped over on its back. McKay was promptly rescued by an Air Force medical team standing by near the launch site, and eventually recovered to fly the X-15 again. But his injuries, more serious than at first thought, eventually forced his retirement from NASA. The aircraft was sent back to the manufacturer, where it underwent extensive repairs and modifications. It returned to Edwards in February 1964 as the X-15A-2, with a longer fuselage (52 ft 5 in) and external fuel tanks.The basic X-15 was a rocket-powered aircraft 50 ft long with a wingspan of 22 ft. It was a missile-shaped vehicle with an unusual wedge-shaped vertical tail, thin stubby wings, and unique side fairings that extended along the side of the fuselage.